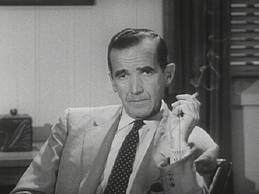 ← AN ANALYSIS OF TV NEWS – FROM 1958 (PART I)! AN ANALYSIS OF TV NEWS – FROM 1958 (PART II)! 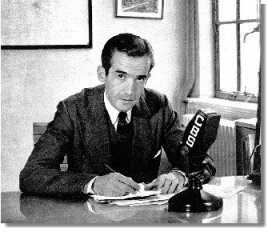 Here is part II of my three part post featuring a visionary speech made to the Radio and Television News Directors Association by the late, great, iconic Edward R. Murrow on October 15, 1958. I have italicized certain parts I regard as being relevant today. Nowhere is this better illustrated than by the fact that the chairman of the Federal Communications Commission publicly prods broadcasters to engage in their legal right to editorialize. Of course, to undertake an editorial policy, overt and clearly labeled, and obviously unsponsored, requires a station or a network to be responsible. Most stations today probably do not have the manpower to assume this responsibility, but the manpower could be recruited. Editorials would not be profitable; if they had a cutting edge, they might even offend. It is much easier, much less troublesome, to use the money-making machine of television and radio merely as a conduit through which to channel anything that is not libelous, obscene or defamatory. In that way one has the illusion of power without responsibility. In this kind of complex and confusing world, you can’t tell very much about the why of the news in broadcasts where only three minutes is available for news. The only man who could do that was Elmer Davis, and his kind aren’t about any more. If radio news is to be regarded as a commodity, only acceptable when saleable, then I don’t care what you call it–I say it isn’t news. My memory also goes back to the time when the fear of a slight reduction in business did not result in an immediate cutback in bodies in the news and public affairs department, at a time when network profits had just reached an all-time high. We would all agree, I think, that whether on a station or a network, the stapling machine is a poor substitute for a newsroom typewriter. One of the minor tragedies of television news and information is that the networks will not even defend their vital interests. When my employer, CBS, through a combination of enterprise and good luck, did an interview with Nikita Khrushchev, the President uttered a few ill-chosen, uninformed words on the subject, and the network practically apologized. This produced a rarity. 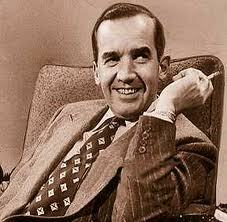 Many newspapers defended the CBS right to produce the program and commended it for initiative. But the other networks remained silent. Likewise, when John Foster Dulles, by personal decree, banned American journalists from going to Communist China, and subsequently offered contradictory explanations, for his fiat the networks entered only a mild protest. Then they apparently forgot the unpleasantness. Can it be that this national industry is content to serve the public interest only with the trickle of news that comes out of Hong Kong, to leave its viewers in ignorance of the cataclysmic changes that are occurring in a nation of six hundred million people? I have no illusions about the difficulties reporting from a dictatorship, but our British and French allies have been better served–in their public interest–with some very useful information from their reporters in Communist China. One of the basic troubles with radio and television news is that both instruments have grown up as an incompatible combination of show business, advertising and news. Each of the three is a rather bizarre and demanding profession. And when you get all three under one roof, the dust never settles. The top management of the networks with a few notable exceptions, has been trained in advertising, research, sales or show business. But by the nature of the coporate structure, they also make the final and crucial decisions having to do with news and public affairs. Frequently they have neither the time nor the competence to do this. It is not easy for the same small group of men to decide whether to buy a new station for millions of dollars, build a new building, alter the rate card, buy a new Western, sell a soap opera, decide what defensive line to take in connection with the latest Congressional inquiry, how much money to spend on promoting a new program, what additions or deletions should be made in the existing covey or clutch of vice-presidents, and at the same time– frequently on the same long day–to give mature, thoughtful consideration to the manifold problems that confront those who are charged with the responsibility for news and public affairs. Sometimes there is a clash between the public interest and the corporate interest. A telephone call or a letter from the proper quarter in Washington is treated rather more seriously than a communication from an irate but not politically potent viewer. It is tempting enough to give away a little air time for frequently irresponsible and unwarranted utterances in an effort to temper the wind of criticism. Upon occasion, economics and editorial judgment are in conflict. And there is no law which says that dollars will be defeated by duty. Not so long ago the President of the United States delivered a television address to the nation. He was discoursing on the possibility or probability of war between this nation and the Soviet Union and Communist China–a reasonably compelling subject. Two networks, CBS and NBC, delayed that broadcast for an hour and fifteen minutes. If this decision was dictated by anything other than financial reasons, the networks didn’t deign to explain those reasons. That hour-and-fifteen-minute delay, by the way, is about twice the time required for an ICBM to travel from the Soviet Union to major targets in the United States. It is difficult to believe that this decision was made by men who love, respect and understand news. So far, I have been dealing largely with the deficit side of the ledger, and the items could be expanded. But I have said, and I believe, that potentially we have in this country a free enterprise system of radio and television which is superior to any other. But to achieve its promise, it must be both free and enterprising. There is no suggestion here that networks or individual stations should operate as philanthropies. But I can find nothing in the Bill of Rights or the Communications Act which says that they must increase their net profits each year, lest the Republic collapse. 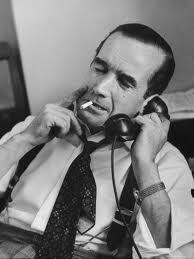 I do not suggest that news and information should be subsidized by foundations or private subscriptions. I am aware that the networks have expended, and are expending, very considerable sums of money on public affairs programs from which they cannot hope to receive any financial reward. I have had the privilege at CBS of presiding over a considerable number of such programs. I testify, and am able to stand here and say, that I have never had a program turned down by my superiors because of the money it would cost. But we all know that you cannot reach the potential maximum audience in marginal time with a sustaining program. This is so because so many stations on the network–any network–will decline to carry it. Every licensee who applies for a grant to operate in the public interest, convenience and necessity makes certain promises as to what he will do in terms of program content. Many recipients of licenses have, in blunt language, welshed on those promises. The money-making machine somehow blunts their memories. The only remedy for this is closer inspection and punitive action by the F.C.C. But in the view of many this would come perilously close to supervision of program content by a federal agency. So it seems that we cannot rely on philanthropic support or foundation subsidies; we cannot follow the “sustaining route”–the networks cannot pay all the freight–and the F.C.C. cannot or will not discipline those who abuse the facilities that belong to the public. What, then, is the answer? Do we merely stay in our comfortable nests, concluding that the obligation of these instruments has been discharged when we work at the job of informing the public for a minimum of time? Or do we believe that the preservation of the Republic is a seven-day-a-week job, demanding more awareness, better skills and more perseverance than we have yet contemplated. I am frightened by the imbalance, the constant striving to reach the largest possible audience for everything; by the absence of a sustained study of the state of the nation. Heywood Broun once said, ‘No body politic is healthy until it begins to itch.’ I would like television to produce some itching pills rather than this endless outpouring of tranquilizers. It can be done. Maybe it won’t be, but it could. Let us not shoot the wrong piano player. Do not be deluded into believing that the titular heads of the networks control what appears on their networks. They all have better taste. All are responsible to stockholders, and in my experience all are honorable men. But they must schedule what they can sell in the public market. PART III OF THIS SEGMENT WILL APPEAR IN ANOTHER 3 DAYS. DON’T MISS IT! 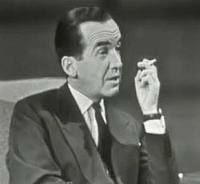 This entry was posted in commentary, economics, History and tagged CBS, Edward R. Murrow, mainstream media, NBC, television news. Bookmark the permalink. 2 Responses to AN ANALYSIS OF TV NEWS – FROM 1958 (PART II)! 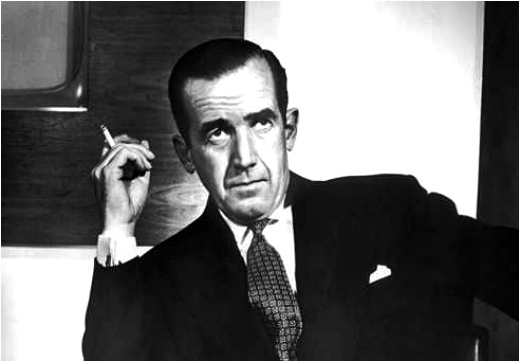 It’s easy to see why Murrow was and still is revered by so many, even if they largely failed to carry his message forward, much less insist that the sense of it change their industry for the better. Truer words were never spoken, S.W., and I agree completely. Wait until you read part III – you’ll be dazzled by his brilliance!